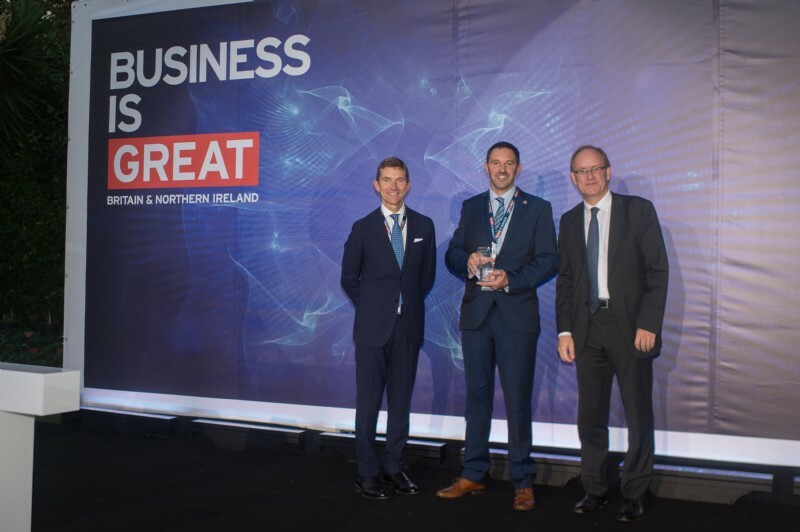 Severn Lamb are extremely proud to have been presented with the "New to Market Award" by Chris Sainty, Her Majesty's Ambassador to Portugal at the Department for International Trade's Business Awards at the British Embassy in Lisbon, Portugal last week. "The objective of this evening is to hand out awards to very, very special people" stated Andrew Mitchell, Her Majesty's Trade Commissioner for Europe who opened the awards evening. "Thank you again to all the companies that have trusted us to support their international endeavours. It has been a pleasure to work with innovative and ambitious businesses" added Chris Sainty. Pictured is Patrick Severn Lamb, Managing Director of Severn Lamb being presented with the award by Chris Sainty, HM Ambassador to Portugal and Andrew Mitchell, HM Trade Commissioner for Europe.